No tools? No problem. No charger by the bed? Still no problem. The only thing the Pons bed doesn't seem to do is actually tuck you in at night. Technology is slowly invading the bedroom. This time, we’re not talking about anything that vibrates, pulsates, needs to be cleaned after each use, or is marketed exclusively using euphemisms. We’re actually referring to a generally low-tech element of bedrooms: the bed. They might seem to work those graveyard shifts pretty well, but there’s always room for improvement. The makers of the Pons bed certainly seem to think so, which is why they spent two years of research and development rethinking every component of the key piece of furniture–from frame, to mattress, to bedding and pillows. Underpinning all the other stuff that is part of the Pons system is its handy-dandy bed frame. What sets this particular bed frame apart is that it can be assembled and disassembled without the use of any tools. That means never having to break out the driver, drill, hammer, spanner, or whatever else you generally use to put a frame together. Instead, you simply join each element of the frame; the headboard and foot rails fit right into the side rails, and the support beams are placed down the middle. 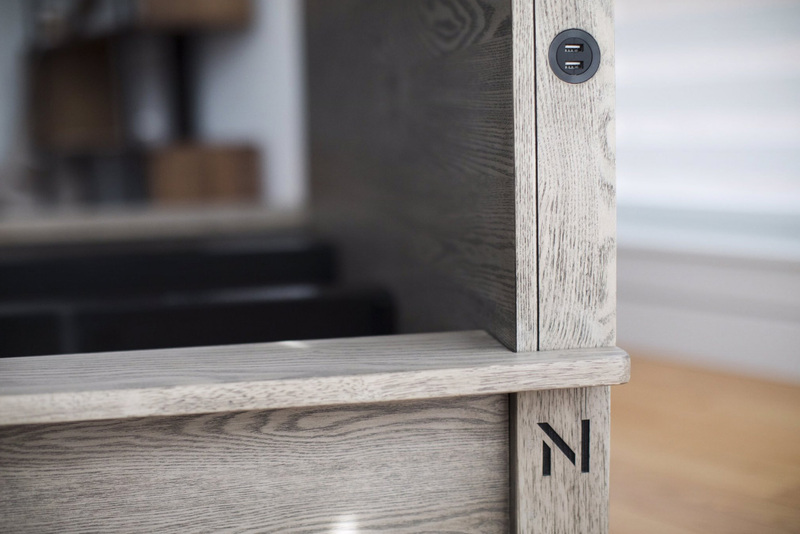 Another interesting feature of the Pons bed frame is that it comes with built-in USB ports. That’s been done for those of us who’ve had to either position a bed in such a way that it’s close to an outlet or find long cables to reach it from a distance. The USB ports have a power specification of 5 amps and 6 volts. It is probably not advisable to use your phone while trying to get some shuteye, but it’s also nice to have the option of plugging right into the bed. Now coming to the mattress. The memory foam it is packed with is supplanted with a layer of ‘PONSfoam’, which is meant to add to the bounce and overall comfort. An eco-friendly gel is used to keep the mattress cool, which is a thoughtful addition considering heat is every sleeper’s kryptonite according to science. The bedding and pillows also contribute to the sleep-conducive environment, using nanotechnology to absorb any moisture or heat. The Pons bed frame and mattress are currently available for purchase via the website, with the sheets, comforter, and pillows on their way soon. The hardwood frame is priced $1,199 and comes only in the Queen size at the moment. The mattress starts at $599 for the Twin size and goes all the way up to $999 for the King size. It’s a bit on the pricey side, but Pons might just be what we need to get the industry to reevaluate the products we entrust our sleep–and in turn our health–with. You are only going to get a select crowd of consumers when you are talking about 1 element of the product like this bed. Not having tools is one thing, but the fact that it is cheaper than Ikea and has the USB ports is a major bonus, don’t you think? I think this is a great product for the college kids out there. Never having their own tools in the first place and then having to move every so often, this would take some of that stress away.